1960 : May 15, 1960, at Andance, General Constituent Assembly with 137 members and 4,790 F in capital. Vatting capacity was 8,326 hl. First grape harvest of local wine : 4,074 hl. 1964 : First expansion: construction of 9,000 hl vatting capacity. 1969 : The decree dated 15 June 1956 pertaining to the extension of the area SAINT-JOSEPH is amended by decree dated 5 June 1969. As of that date, the region covered by the appellation encompasses 23 communes in the département of Ardèche and 3 communes in Loire, totalling 6,002 ha. 1973 : First harvest of Saint-Joseph, amounting to 331 hl. 1974 : 18 December 1974, first bottling of 2,000 bottles of Saint-Joseph. Extension with a two-storey building to house 3,200 hl. 1982/84 : 1,600 m² extension on two floors, part of it dedicated to maturing, storage capacity 400,000 bottles. 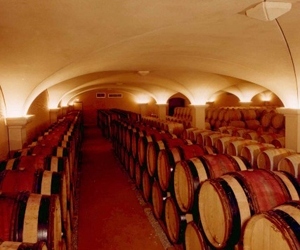 7,300 hl of temperature-controlled vats, air-conditioning of the buildings, maturing cellar with oak casks (225 litre). 1990 : The ‘Société Civile d’Exploitation Agricole de Rochevine’ set up, which at that time owned 1.5 ha of Condrieu and 20 ha of Saint-Joseph. 1991 : Beginning of works on Saint-Joseph hillside vineyards, planting of 6 ha on terraced vineyards situated opposite the winery. Acquisition of pneumatic pressing machines. 1992 : First harvest of Condrieu. Planting of 9 ha of Saint-Joseph on terraced vineyards. Creation of a bottling and storage cellar with an area of 2,000 m². 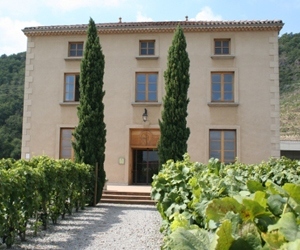 1994 : Creation of the Maison des Vins [Wine Centre]. 2000 : 40th anniversary of the Winery, with a further extension of 900 m² on 2 levels, including a vaulted cellar for ageing and maturing Saint-Joseph wines in casks (800 casks). First Cuvée of Saint-Joseph red Septentrio. 2004 : Creation of an ‘Aroma Trail’ at the Maison des Vins. 2005 : Merger/takeover of the Sarras winery. The entity represents nearly 50% of the area for Saint-Joseph (18,000 hl). More than 350 co-operating wine-growers. 2014 : Creation of a motorhome area on the winery car-park, including full service station (water, electricity, waste disposal). 2015 : Creation of Cave Saint-Désirat Facebook page. 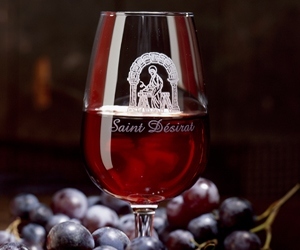 2017 : Modernisation of Saint-Désirat winery, with significant works to create a larger, more modern sales and tasting area, associating wood and stone to welcome 70,000 visitors per year. Creation of a guided tour of the cellar in 3D using VR glasses and 360° films. 2018 : Creation of a Discovery Trail for the Domaine de Rochevine (Domaine de la Cave). Featuring 10 fun and instructive information points, the trail will cover a distance of 3 km. Aided by a route map, it will help visitors discover the history of the Winery and vineyard. Winner of the “Vue sur Vigne” prize 2018.